Please send us an enquiry for a tailormade offer. Wellness is the next societal revolution. Following the Industrial revolution and the Internet revolution, Wellness is emerging as the next major shift in our way of thinking. People are becoming increasingly aware that we need to care for our bodies and minds to maintain quality of life as we age. How this links to our environment is integral to this thinking. Wellness in the Wild provides innovative, sensitively crafted, appropriate wellness experiences in wilderness locations. Through partnering with like-minded entrepreneurs Wellness in the Wild enhances the guest experience for discerning travellers; supports local communities while protecting the environment and its resources. WHAT IS WELLNESS IN THE WILD? 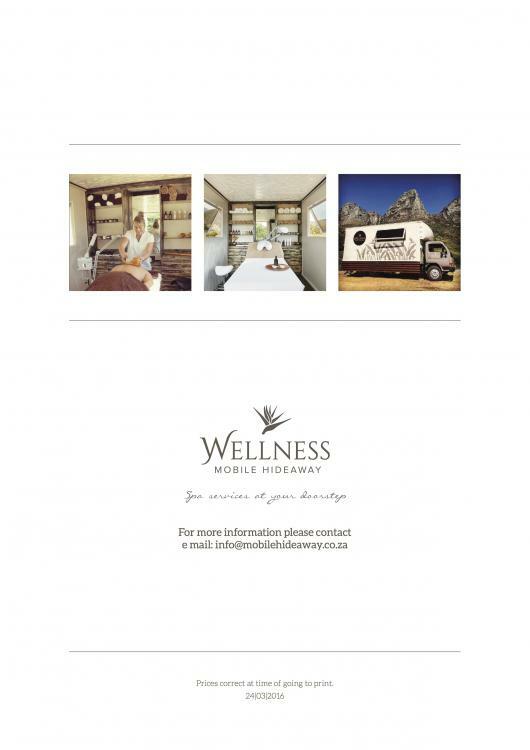 Wellness in the Wild is a South African based company delivering high standard wellness treatments to guests within wilderness areas, which have strong community and conservation commitment. Treatments, inspired by African traditions and the natural environment, are customized to meet the needs of your guests. Not only do we offer standard treatments such as massages, facials, pedicures, manicures, and body wraps, but also yoga, Nordic walks or exercises with a personal trainer. 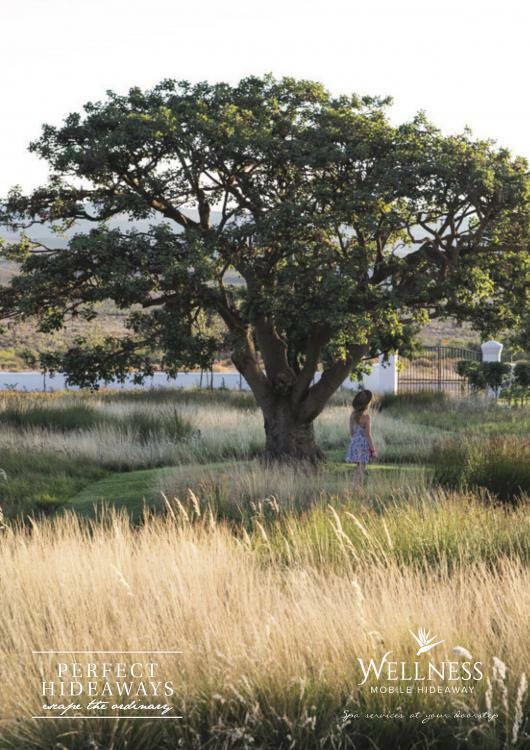 We donate a percentage of our turnover to environmental conservation initiatives. We train local staff and buy their sustainably harvested products. Apart from training in hospitality, we empower our staff with a holistic approach to life, recognizing that a healthy environment is the foundation for a healthy life. This ethos is also at the heart of our offerings to guests. WHAT IS WELLNESS MOBILE HIDEAWAY? With our mobile spa we deliver a deluxe experience at your doorstep, wherever you are and wherever you want us to pamper you. Our Mobile retreat gives you the opportunity to enjoy your luxury and remote surroundings while enjoying an ultimate spa experience inside or outside your house. Wherever you prefer! Our mobile hideaway is equipped with a full spa treatment facility for massage, manicure, pedicure, full body treatments and facials. Our staff exists of one or two therapists and a driver. What a way to make your perfect hideaway even more perfect. Please note that we need 15 minutes to prepare and 15 minutes to wrap things up afterwards. We accept all mayor credit cards. Most products we use are available in our small shop. If a product is out of stock we are happy to send it to you. Hydra-boost Face Ritual 60 min R750. This “high in anti-oxidant” treatment helps minimize the appearance of fine lines and wrinkles while feeding the skin with deep hydration and nourishment. Glow and Radiance Face Ritual 60 min R650. This treatment is designed to renew even the most lifeless skin, incorporating the essential oils of Jasmine and Baobab. Balancing Face Ritual 60 min R650. An unmatched and effective skin treatment developed to restore, purify and revitalize the skin with the use of Neroli and Rose essential oils. Facial for men 60 min R650. A deep cleansing, balances and purifying skin treatment for congested skin. Purifying Teen Facial Treatment 60 min R350 (-12Y) R450 (12y-18Y). A decongesting and healing facial for the problematic teen skin. Face Ritual with Hot Stone Facial Massage 90 min R900. A restorative and revitalising facial, incorporating hot stones. Classic Manicure 60 min R450 (express 30 min R300). For the client on the go. A manicure to reshape the nails, neaten up the cuticles and massage moisture into the hands. Finished with a fresh coat of Nail Lacquer. Classic Pedicure 60 min R450 (express 30 min R300). Refresh and beautify the feet in a jiffy. Feet are soaked, skin is gently exfoliated, cuticles are perfected, and nails are clipped, reshaped, buffed and polished. Finished with a fresh coat of Nail Lacquer. Organic Handprint Ceremony 90 min R700. Intensive therapy for dry, parched hands. Hands are soaked, skin is gently exfoliated, cuticles are perfected, and nails are clipped, reshaped, buffed and polished. Have your hands re-moisturised by a hydrating hand mask and massage. Finished with a fresh coat of Nail Lacquer. Organic Footprint Ceremony 90 min R700. Your solution to dry heels and over taxed feet. Nails and cuticles are perfected, feet are exfoliated and hard skin is gently removed. Finished with a fresh coat of Nail lacquer. Pure Being Massage 90 min R900. A full body massage, including a facial cleanse and scalp massage. Earth Soul Massage 90 min R900. A customised body massage, designed to induce relaxation and restore balance to mind, body and soul by the use of the calabash and bamboo stick. Pure Bliss Back Massage 30 min R400, 45 min R500. A back, neck, shoulder and scalp massage to release tension, invigorate and rejuvenate a tired upper body. Scalp Massage 30 min R400. Meridian Foot Reflexology 45 min R500. Little indulgence Massage 45 min R500. A relaxing back, neck and back of legs massage. A little Indulgence for a short while. Deep tissue Massage 60 min R650. This vigorous massage combines a variety of compression, stretch and cross fibre friction techniques. Swedish Massage 60 min R650 90 min R900. A blend of Swedish massage techniques to invigorate the muscles, energize, increase blood circulation and release tension. Melt-away Stone Massage 60 min R700. Back, neck and shoulder stone Massage 45 min R500. The perfect balance of hands and stones, bringing balance to the body. Kalahari Melon hydrating Treatment For intensive hydration and skin softening effects while being pampered from head to toe. African Potato Repairing Treatment The African potato is amazingly repairing, Healing and all anti-oxidant rich treatment to all sensitive skin conditions (such as eczema, psoriasis, dermatitis & sun-burned skin etc.) while it also firms the skin and contours the body. African Ginger Firming treatment This is a stimulating treatment that will increase circulation which has body slimming and skin firming effects. Mongongo-Nut Detoxing Treatment This is a good de-toxing treatment with Mongongo Nut Oil which helps to reduce non medical fluid retention by draining and eliminating toxins in the body. Coffee, Cinnamon & Orange Cellu-Low Treatment This treatment concentrates on cellulite reduction while feeling invigorated. Great results are achieved when this treatment is used in combination with a weight loss program and fitness program. Please note that we ask a minimum treatment amount and travel costs.